Liu Gong Village, a less-know village, is located in the Yangshuo countryside 13 kilometers from Yangshuo County. It's located along the banks of the Li River and features beautiful scenery - both within the village area, banks of the Li River and journey through the Yangshuo countryside to get there! It is one of the few old villages in Guilin Area which offers rural scenery, the local culture and well-preserved ancient buildings. Visitors to Yangshuo are always amazed at the seemingly never-ending karst mountains and rivers that stretch for as far as the eye can see. Aside from the Li River Cruise when travelling to Guilin, visitors also enjoy experiencing the karst scenery up-close and even climbing some of the karst mountains! In Liu Gong Village, visitors can explore the local life - seeing children playing on the road, housewives washing clothes by the river which runs around the village and peasants doing their daily activities in the fields, the old buildings with a history of nearly 400 years which were built in black bricks and tiles and appreciate the stunning rural scenery - the unique Three-color Pond where the water has three colors. 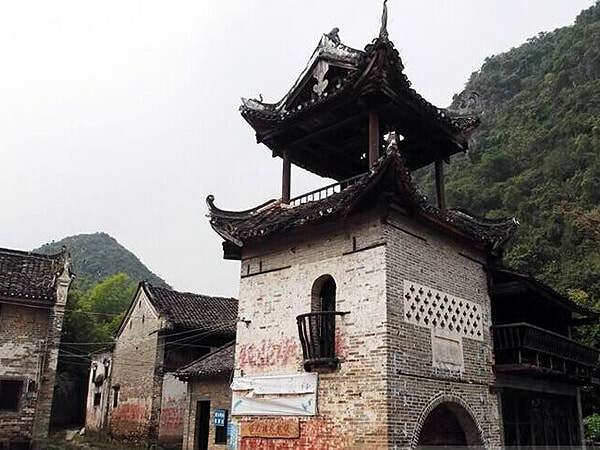 Originally built in Ming Dynasty (1368 - 1644) and located by the Li River, Deyue Building (得月楼) is considered the gate of the village. If you are lucky enough, you can enjoy the folk dances, including Guangxi Opera, lion dancing and the unique local opera - Caidiao Opera originated in the Guilin Area on the 10th of October in the lunar calendar. The day is called “Shiyue Xiang Festival” (十月香). Visitors can also partake in kayaking along the Li River (from Liugong Village) and the countryside road to/from Liugong Village is particularly scenic, making an excellent afternoon cycling activity! If you are planning to visit Liu Gong Village for photography, the best time to visit is from April to October. During this period, the landscape is stunning and the weather is comfortable. But it rains a lot from the middle April to the the early May. ​If you are interested to experience local folk culture, it is suggested you visit the village on the 10th of October in the lunar calendar. If you would like to explore the golden fields, you can visit it between the middle July and the early August. Probably, you will encounter farmers who are harvesting the rice through the local method in the fields. Liu Gong Village is located in the Yangshuo countryside which is some 13 kilometers from Yangshuo. Take a bus from both Guilin or Yangshuo to Fuli Town. From Fuli Town, take a local minibus to Liu Gong Village and wait for you whilst you visit the village. Rent a bicycle from Yangshuo and cycle along the backroads to Liu Gong Village! Please remember to take a map with you but this is definitely the most scenic and enjoyable way to spend an afternoon in Yangshuo! Wear the sunscreen cream on fine days to protect your skin. Bring a raincoat or an umbrella with you on any kinds of weather for sometimes it can be rainy and sunny in one day. If you don’t want to have lunch at one local restaurant, please take enough food with you. Interested in visiting Liugong Village on a Tour? Wendy Wei Tours offers a variety of different packaged tours as well as custom tours including Liugong Village, among other attractions and destinations. To find out more, please visit our Tours page or Contact Us directly to find out more.